More than one-fourth of Americans eligible to enlist in our armed forces are too obese or out of shape to qualify. So our military is starting pre-boot camp boot camp to get them into shape. On a recent visit to a Washington, D.C. conference, I learned this from Sam Kass, White House Assistant Chef , who works with First Lady Michelle Obama on her Let’s Move program. For years now, restaurateurs would tell you that people talk healthy, but order what they want. That is changing. Now there is an emerging group of committed diners talking and ordering healthfully. The Center for Disease control reports that 35% of adults over the age of 18 engage in “regular leisure time physical activity.” Back here in urban Texas and other major metropolitan areas, there is a subset of that 35% who are heavily identified with their lifting, cardio and diet. They aspire to purity and resist temptation when they can. Personal trainers set an example, since some of them haven’t eaten anything other than a skinless grilled chicken breast and some steamed vegetables since 1998. Add to that group those people with various health problems that can be treated through nutrition, and you have more demand than ever for the healthy-to-go or healthy fast-food trend. 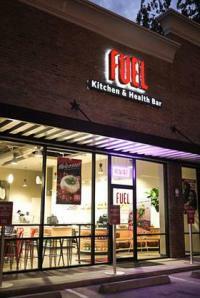 Recently, Alison Wollam of the Houston Business Journal talked with me for her article, “New Healthy Fast Food Player Joins Crowded Local Market. No single national restaurant player currently owns this trend. Some of the operators are Houston’s My Fit Foods or Fuel Kitchen and Health Bar, Austin’s Snap, or Southpaw’s Organic Grill in Dallas. There are local players in other cities, but are any of them going to become the Jenny Craig for the 21st century? It is going to take capital, infrastructure, management, and marketing to grow these businesses. But hold on! That could be the sound of Jenny Craig in the background re-tooling for the organic-hormone-and-antibiotic-free-locally-sourced age. You never know.